Hassey | Do Duy is superbly experienced at treating and preventing all forms of periodontal disease, also called gum disease. Measuring the depth of the gum line surrounding teeth to discover deep pockets. We specifically measure the depth of the "sulcus" – which is the space between gum line and the tooth. Observing the gum tissue for reddish color, or spots of bleeding gums. Examining the gums to check for swollen gums. 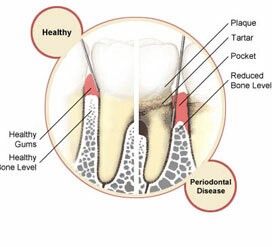 Deep pockets in the gums are habitats where harmful bacteria thrive. In the event that our dental team discovers deep pockets in a patients gum line, Dr. Hassey and Dr. Do Duy will discuss different methods of treatment and rehabilitation. The American Heart Association has found a direct correlation between gum disease and heart disease, making it vitally important to discover and treat all forms of periodontal disease. Contact our Methuen MA dental office today and schedule your appointment with us.